Three Pipe Problem: A female sitter in the Czartoryski Raphael? A female sitter in the Czartoryski Raphael? A recent post at 3PP presented a very comprehensive study of the attribution and provenance history of a famed Portrait of a Young Man, usually attributed to Raphael. The painting was one of those looted from the Czartoryski collection in Poland by the Nazis during WWII and has still not been recovered. Scholars have tried to identify the sitter as a young man, either real or idealized. Some have even suggested a Raphael self-portrait. However Oskar Fischel, a renowned Austrian born scholar had claimed that the sitter was a young woman. Fischel's view struck a chord with me for on first glance the sitter appeared to me to be a woman of a particular kind. The painting reminded me of Giorgione’s Portrait of a Young Woman or Laura where a young woman in a state of undress is partially covered with a man’s robe. Scholars of Venetian art have noted that both the disheveled look and the man’s robe indicate a courtesan. In Giorgione, Myth and Enigma, the catalog of the 2004 Giorgione exhibition, the entry for Giorgione’s Laura noted the following. According to Junkermann (1993) she is wearing a male garment, which far from being a reference to marriage, instead indicates that the model has adopted a typical male role, perhaps that of a poet; but that does not exclude that she may also be a courtesan. Her sumptuous fur-lined red garment is, more than an item of male attire, the winter dress of Venetian women of pleasure. 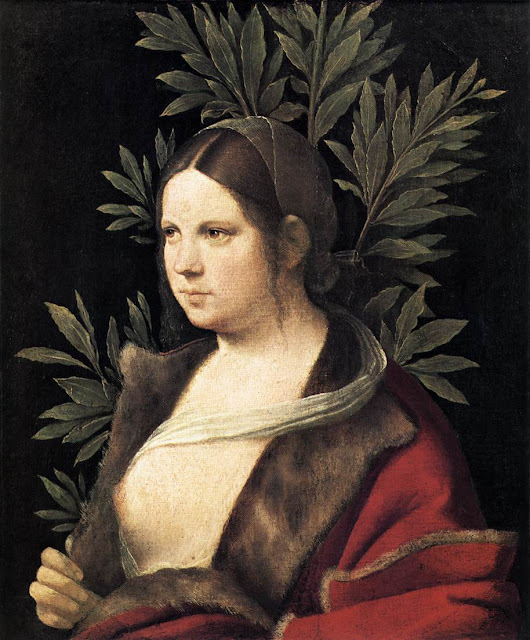 Giorgione's Laura. A fur lined gown as an allusion to a courtesan. Since ancient Roman times the term Lupae (she-wolves) has been used to describe prostitutes (See Mazzoni) -ed. My first impression led me to take a look through other Raphael portraits of men and women. Men’s foreheads are usually covered with a cap that sits firmly on top of the head and not worn at the same rakish angle as in the lost painting. Raphael’s women, even Madonnas, inevitably have their foreheads exposed with hair neatly parted in the middle. The portraits of Agnolo Doni and Maddalena Strozzi provide a striking example of hair fashion around 1505-6. The man’s forehead is covered with his cap firmly on top of his head. The woman’s long hair is parted neatly in the middle and her hair is covered with a diaphanous veil. Things are much the same ten years later if we compare the Portrait of Baldassare Castiglione with La Donna Velata. Castiglione’s cap is firmly atop his head and completely covers his forehead. The donna’s forehead is uncovered with long hair parted neatly in the middle. The back of her head is covered with a long white veil. Even the famous La Fornarina has hair neatly parted in the middle but with her hair tied back with a scarf. 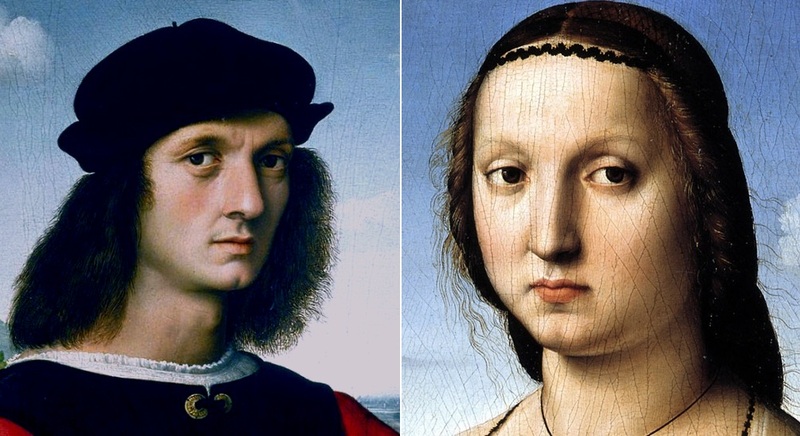 It is true that most of Raphael’s woman have hair well done up and combed, but in the case of the Czartoryki portrait, it can be perhaps argued that Raphael is depicting a courtesan posing in her lover’s clothing. 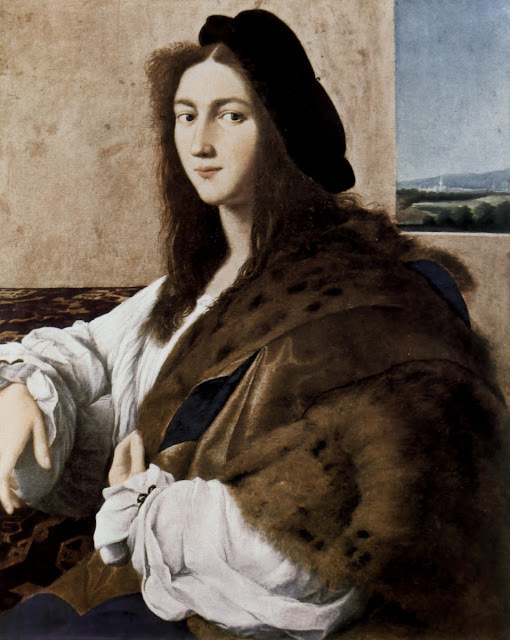 It looks like she’s sitting in her shift with a man’s robe casually thrown over her shoulder, and a man’s cap pinned to the back of her head, to indicate an intimate bond, in a somewhat less obvious way than Raphael did in La Fornarina, with the inscribed armlet. Oskar Fischel’s two-volume study of Raphael represented the culmination of a lifetime devoted to the rehabilitation of Raphael. His study of Raphael was translated and published in London in 1948 with the first volume containing text, and the second prints. Fischel devoted only half a page to the Czartoryski painting discussing it after the more famous La Donna Velata. Fischel's discussion of the Czartoryski portrait makes specific reference to La Donna. Like the Czartoryski painting Fischel was also a casualty of the Nazis in 1933 when he was dismissed from his post at the University of Berlin by the new Hitler regime. Student protests forced his reinstatement but he was finally dismissed in 1935. Apparently, museum officials in London were successful in bringing him to London where he died in 1939. Barring any new evidence coming to light, Fischel's interpretation of the sitter as a woman is likely to remain part of the rich tapestry of readings offered for this work throughout history. What do readers think - is it Raphael, or another anonymous man or woman? -ed. Fischel, O. Raphael. Translated from the German by Bernard Rackham, Volume I. London, 1948. This picture has so many enigmas! With the absence of the actual object and a no direct documents related to the patron or artist, we are left to make brave guesses based on what we know of the artist's life and social circle. I am curious to know if we have any other confirmed images of a Roman courtesan - one would think a picture such as 'La Fornarina' or Giulio Romano's 'Woman with a Mirror' more closely resemble this type of portrait in a Roman context. Thank you to Dr DeStefano, and 3PP for hosting this intriguing post! Who is to say that this is not a hint at Raphael's own proclivities? The sexual ambiguity could be alluding more to his own sexual orientation than someone elses? The baring of a breast would have settled the matter. La Fornarina comes to mind here. But this is where my lack of knowledge on the the symbolism employed in High Renaissance art fails me. @Stephanie - well stated - one would imagine a courtesan portrait, intended for very private chambers to look more like La Fornarina or the wonderful Giulio example you cite. If anything perhaps, it makes us appreciate the Czartoryski picture further - what is about exactly? Some commentators seem to think it not a portrait at all. @Debrina - interesting point. Unlike Leonardo and Michelangelo, we don't get a sense of any homosexual proclivity from primary sources or biographies of Raphael. In fact his sexual excess and fondness for women is cited by Vasari as the reason for the illness which caused his premature death in 1520. That being said, were he predisposed to this type of activity, it would hardly be something that would be widely documented, so we may never know for certain. This image, to me, has characteristics of both male and female. Cover up the mouth and below...and the eyes, nose and the rest appear to me to be more male. Cover up the nose and above... now the mouth, chin and hair appear to be more female. I do wish that some day this painting does see the light of day again! I would like to get a look at x-ray, uv or infrared images of it. The bottom portion of the face taken in isolation does appear unmistakably feminine. I don't think the upper portion is that clear cut. In my case I initially saw a woman and the hair-style and clothing only verified my initial impression. Reading Fischel, I then discovered that he had seen much more than I had.